Red currants (Ribes sativum) are deciduous shrubs that produce edible red berries. Clusters of flowers are joined together by drooping stems, and red berries form after the flowers fade. One mature red currant bush can produce four to eight quarts of berries. Red currant bushes are productive for 20 years. Red currants are picked as they turn red for use in pies and sauces. Berries picked for fresh use are picked three weeks after they turn red. Remove brush, grass, weeds and rocks from a site located in full sun or partial shade. Pick a site that provides protection from the wind. Exposure to drying winds will reduce plant and fruit size. Loosen the soil to the depth of 18 inches with a shovel. Remove buried rocks, sticks and root masses. Spread a 4-inch layer of compost, well-rotted manure or peat moss on top of the soil. Mix the soil amendments in with your shovel. 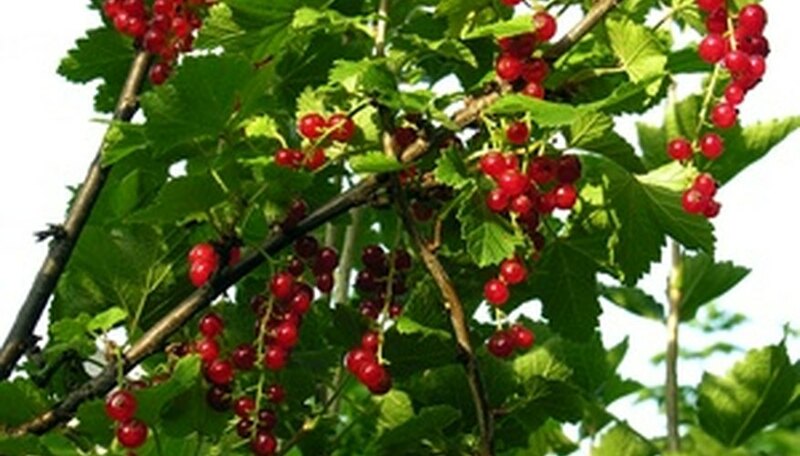 Examine your red currant bush for damaged roots and branches. Prune away any damaged area with sharp pruning shears. Cut the top branches back to 5 inches above the roots. Dig a hole 1 to 2 inches deeper than the roots and 12 inches wider. Put the red currant bush in the hole and spread the roots out. Fill the hole with soil and gently firm the soil around the plant. Do not push the soil down too hard since this will compact the soil. Plant the rest of your red currant plants 5 feet apart. Water the area well by flooding the site with water. Let the water soak into the ground for 15 minutes. Spread 3 to 6 inches of straw mulch around the plants. This keeps the soil cool, reduces weed growth and minimizes water loss. Red currants are commonly propagated by nurseries using stem cuttings. These are usually sold as 1- or 2-year bare-root plants. A variety of insect pests and diseases affect red currants. Avoid these problems by buying quality, healthy and disease-free plants.